Ubisoft is a global game developer and publisher known for its many AAA titles. 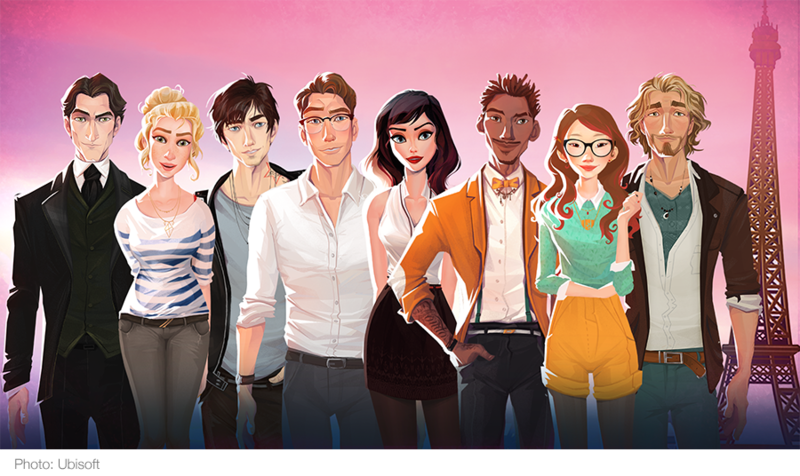 In February 2017, the company surprised the industry with a narrative game for mobile, City of Love: Paris (Android, iOS). Narrative games have been around for many years, but City of Love: Paris stands out with its impeccable art and its captivating story. All character animations in the game are powered by Live2D Cubism. Last month, we spoke with Game Producer Barnabé Anglade about how the game came to be, what challenges it faced, and where his team is heading next. — It was surprising to see a narrative game for mobiles coming from Ubisoft. Can you tell me how the project started? Barnabé Anglade: City of Love: Paris started in November 2015. I wanted to do a project focusing on narrative design with mobile format in mind, using a simple structure but with a strong production value. So I gathered a team made of people showing a strong motivation toward that goal. At Ubisoft, we are very free in terms of creative direction, but at the same time we need to make sure that the game meets its audience. Beyond our personal appreciation of this genre, we observed that narrative games were becoming a promising market on mobiles particularly for female users, but most were showing poor quality in terms of art and writing. We carefully thought about how to position our game. We did not want to make an Otome-style dating-sim, but rather try to create a western adventure with romantic aspects in it. As a team based in Paris, we also knew that the city we live in tends to fascinate quite a lot of people, so we chose it as our main setting, not only because we love Paris but also to show a different side of it. That way, we became confident that we could differentiate the game within this growing market. — The game is aesthetically very polished with great attention to detail and has a distinctive art style. Why this particular art style? Barnabé Anglade: Basically, we went for the style which suited the best our talented artists! Our initial focus was on character and background design. We came across artworks made by a German artist, Celia Kaspar, and fell in love with her style, a daring mix between cartoon and realism, strength and emotion. So we contacted her directly and as she liked our concept she joined the team! Still, we wanted to see how our take on art would appeal to our target audience. Great thing about Ubisoft is that we have Consumer Study Department that would help us validate our direction with consumer insights rather than relying entirely on our own artistic intuition. So we worked together with Celia and created two additional art style concepts, one more cartoony, one more realistic; but the study showed that the original art style was the most appealing, so we were quite happy about it! (laughs). important to deliver a good story with highly polished art. — Ubisoft gave your team creative freedom, yet increasing chances of success. Did you do any playtests? If so, how? Barnabé Anglade: Yes, after deciding on the direction, we came up with a prototype and conducted a test with about 20 Canadian women. This took place in Halifax, a Canadian Ubisoft studio, as casual players in North America were our primary target and romantic aspects can be culture dependent. During the tests, we filmed the testers playing the game, while they were giving instant feedback. After each test session an interview was conducted. The results were very positive in terms of art and animation which further validated our concept. However, they unanimously suggested that the game lacked a strong plot and a sense of purpose to drive the characters and to engage the players throughout the game. This was a valuable lead for us to iterate on the story as we started with too much of a “light” tone. Few months of iterations later, we beta-tested in Ireland and soft-launched in Canada. — The story is quite engaging. Is it based on a real story or did it originate from a book? Barnabé Anglade: No, it’s an original story but it’s filled with many references which players can relate to. As I said, the game’s not a dating-sim. Players enjoy not only the romantic aspects but also Paris itself and the mysteries to solve. Choices made throughout the story influence the affinity level of each character towards the player along with the Souvenirs the player can unlock. Each episode leads to a crucial dilemma which have you diverge into very different directions. Although we are a small team with limited resources, it was very important to deliver a good story with highly polished art while giving every player a unique experience, without forcing any decision. about how easy they could be animated. — It seems like you’ve managed just that. What are the people’s reactions and how is the game performing on the market? Barnabé Anglade: It’s off to a great start with many active users and a high engagement level. We have a very simple energy-based economy system, which makes it clear for everyone. Now we keep studying the way players progress on a daily basis. For the game itself, the feedback is incredibly positive, particularly regarding art and animation. Players rarely comment specifically on animation, but there are many, many players praising the way the characters move, feel alive, and how they seem to “be here”. This proves that the animation brings something that makes sense to players and adds a strong value – not just a small plus. — Yes, the animation is subtle yet effective in its own way. It blends well with the overall look and feel. Did you design the characters with the animations in mind? Or did you design the characters first thinking about the animation later? Barnabé Anglade: As I mentioned, we fell in love with the art style of Celia Kaspar. So at first, characters were drawn without thinking about how easy they could be animated. However, we knew that the idle motions would be very important, because we wanted players to spend a lot of time with characters; time to think about choices; time to look a character in the eyes, etc.. We wanted to deliver a visual experience with lively characters instead of a reading experience with static images. Beyond the expected reaction animations, we wanted strong “idle” animations reflecting the current mood of the character, so that even if he’s not talking, he remains a strong lively presence. — What was the development process like? Did you face any technical challenges? Barnabé Anglade: We initially wanted to keep the technical scope very light so that focus could remain on art and narrative design. But that doesn’t mean we didn’t face any challenges (laughs). For Ubisoft Paris studio, it’s our first narrative game, and our first 2D game using Unity – and also the first game using Live2D, not mentioning new online aspect for us. Quite a lot of “first times”! Particularly regarding Live2D we had our concerns. We were worried whether Live2D would fit our art style. In fact, our animator had trouble moving a face to a 3/4 angle, because in contrast to Japanese anime style, our realistic art style made noses look flat and weird. Furthermore, connecting joints for striped clothing and animating a few facial parts like freckles and beards were difficult. Nevertheless, it didn’t take too long for our animator to figure things out and produce the animations we truly wanted. — How many animators do you have? Barnabé Anglade: We only have one animator, and she does all the Live2D Cubism animations. At project start, she was fresh out of school where she was learning 3D animation. In terms of usability, she found Live2D Cubism not being that far from 3D animation tools and got a hang of it quickly. — It feels like the game is evolving fast as new episodes are added every other week. What’s the future of City of Love: Paris and your team? Barnabé Anglade: It’s too early to say, but we think we might build on this new IP as we always try to build on what works for us. This project presents a long-term opportunity to position Ubisoft as a main player among mobile narrative games. In terms of animation, we believe that Live2D Cubism is a strong added value that contributes to quality and efficiency. We would love to further explore its potentials, like animating different angles and stances and swapping facial parts to create own avatars. We are also excited about Live2D Euclid. At some point, we’ll go into an R&D phase to think about a next project, and we would love to try out Live2D Euclid and see if it offers what we need to take things to the next level! 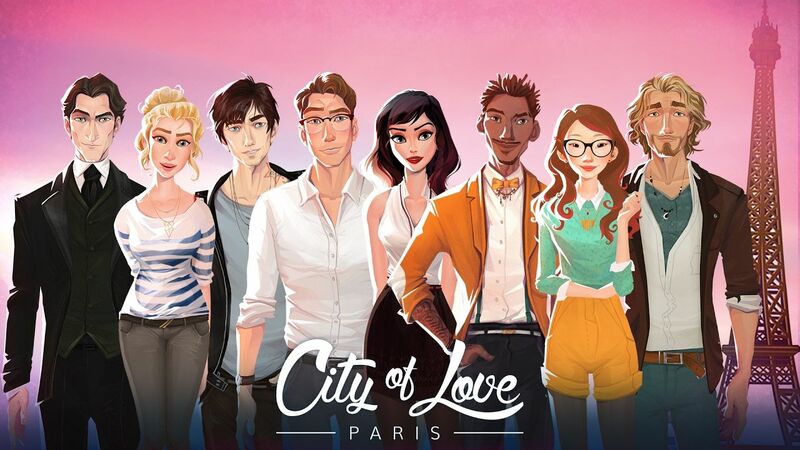 [ City of Love: Paris Goodies – Twitter Giveaway ] ~ Ends May 28! City of Love: Paris team kindly provided original goodies for readers of this article. Follow these steps to win! Step 1. Download City of Love: Paris and Play! Step 2. Tell us what you thought in a tweet with hashtag #Live2D_Ubisoft_COLP before the end of May 28th. Step 3. 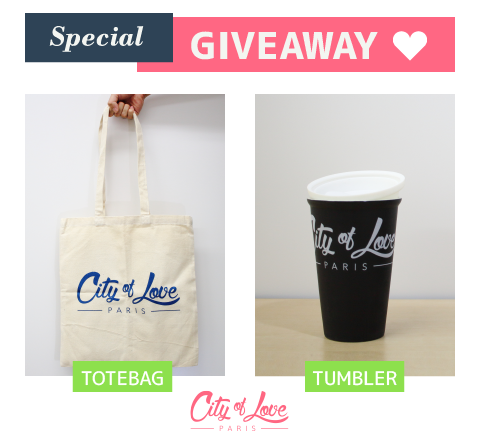 We’ll randomly pick 2 winners for tumbler and 3 winners for tote bag! We’ll contact lucky winners in direct message, so you need to follow us @live2d. We’ll ship worldwide.